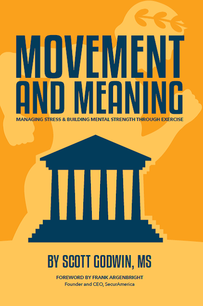 We all know exercise is good for us, but "Movement & Meaning" tells the rest of the story. It's been described as "Lord of the Rings" meets a 21st century manual for stress management. Whether you're a fitness enthusiast, athlete, or totally inactive and unmotivated, this book will forever change your mindset when it comes to being mentally healthy, happy, and strong, by teaching you how to use physical activity as an antidote to stress. Times are tough, the world is changing, and Americans are increasingly struggling to cope. Movement can change your life from the inside out and this book could be the solution you need, a map to successfully navigate the world in front of you and strengthen your mind, body, and spirit for the tumultuous years to come. Work is not what it used to be. In our modern world, work isn’t valued and respected like it should be. Sadly, work seems to have lost much of its inherent meaning. The decline of work is a tragedy because to put it simply: work is a good and noble thing. There was a time when and if a person was working, he or she was likely happy, proud, and fulfilled. Work can be a noble and joyful pursuit, and it’s about much more than just making money. It's time to put the good back into work. Healthy Work: Putting the Good Back into Work applies timeless and cutting-edge principles of healthy living to work, so the reader can learn to create health, meaning, and fulfillment through work. If you're underemployed, unemployed, working but not motivated, or want to be as healthy as you can while working, then this is the book for you. It's been called "Chicken Soup for the Soul meets Harvard Business School" and offers practical action steps for positive change including how to manage work stress, create a healthy work environment, and how to set and attain reasonable work goals. Drawing on years of philosophical and scientific research, personal experience, and applicable case studies, Healthy Work: Putting the Good Back into Work is a timely manifesto and “how-to” manual by the author, Scott Godwin, on how to create a healthy and joyful working life in a stressful and rapidly changing economy and culture. Put simply, this book could change your working life for the better, for good.